The following instructions and pattern diagrams were taken from Garsault's L'art du tailleur, published in the 1760s. The numbering of the paragraphs and the unusual measurement units were taken over from the original. I have added the centimetre equivalents in brackets. Garsault's original text (translated by me) is printed in bold; my own remarks are in square brackets and normal print. To see the full-size pictures, click the thumbnails. 298. The Mantelet & its hood. 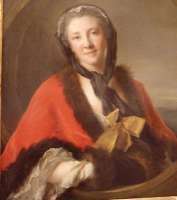 The mantelet is a little cloak for women who wear it over the robe, especially when leaving the house: They are always made with a hood; the hood is cut extra & then attached to the mantelet: All this is made of taffeta which is two Tiers [80 cm] wide, or of satin half an Aune [60 cm] wide; the lining is made of the same fabric. 300. Begin by cutting the two Tiers for the hood, fig. I, which are folded in half widthwise. The rest for the mantelet, fig. II, is likewise folded in half. The neckline is cut as seen from b to n, then the arm cutout m, i.e. those parts that go over the arms and which are called flaps. On the hood folded in half, cut a wedge gh from the fold, narrowing down from four or fice Pouces[10-13 cm]. The tip of the cut will become the centre of radiating pleats i which are laid into the rest of the fold. The cut is closed with a seam. The pleats sit at the back of the head. 301. To attach the hood to the mantelet, begin by pleating the middle of the neckline of the mantelet o o fig II, so as to reduce it to the width of the side of the hood that the wedge has been cut off of. [I.e. g will meet b.] Then this side is sewn to the pleats of the neckline o o and continuing along the backs of the hood & mantelet, gathering the mantelet. [I.e. first a few pleats, then it's just gathered.] Finally, attach a ribbon to the left side all around which creates a tunnel through which one threads a string so as to be able to pull the collar more or less closely to around the neck. The whole is edged with black lace. 302. Mantelets are also made of muslin, but that is the work of the plain seamstress. 303. The plisse and its hood. 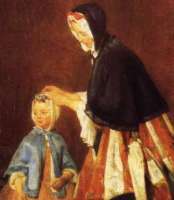 The plisse is another type of cloak, much wider than the mantelet; it is also made of taffeta or satin. 304. For a plisse you need three and a half Aunes [420 cm], disctributed across four equal widths m n o p, fig. III, each 3/4 [90 cm] long. m and n are joined lengthwise so that they together become the back part, then they are folded onto each other and a wedge cut off from the outer edge of each, just as it is done when maing a robe; the same is done to the front parts that have been laid out on on top of the other. The cut-off wedges are joined together two by two. When the back and front parts are joined, there will be a triangular gap as long as the wedges; they are filled with the joined wedges q q. This way you take away width from the top and add it to the bottom. Smooth both with the scissors, at the same time cutting the curve r r into the fronts. In the middle of the front parts, cut an opening s s 6-7 pouces [16-19 cm] long, through which the arms are stuck. The plisse is lined with the same fabric, or with fur for winter. 305. The hood is made extra, from one Tiers [80 cm] square, folded in half as before; & in order to attach it to the plisse, it [the plisse] is pleated from between a Seizième [8 cm] away from the front edge and a seizième from the centre back seam. This reduces it to the measurement of the lower edge of the hood, which is then attached. The rest is done as for the mantelet. The radiating pleats in the hood are done like cartridge pleats, not laid flat. Depending on the thickness of the fabric, there will be a small hole in the centre of the "star". Short silk cloaks are not suitable for the cold season, of course, but I have not found any proof yet that they were made of warmer fabrics. The red one above looks like wool or velvet, though. Logic suggests that they must have been around even if Garsault doesn't mention them. After all, the 18th century falls into the last Little Ice Age, and the thick-walled buildings built then can be awfully cold.